Roger Federer and Serena Williams will be expected to maintain their flawless progress at Wimbledon as the title favourites head into the fourth round looking to survive the tournament's giant-killing carnage on Monday. 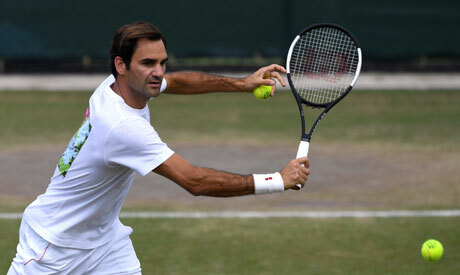 Federer has been in imperious mood in pursuit of his ninth Wimbledon crown, while Williams is rounding into form just as the seven-time champion's rivals have collapsed all around her. In the men's draw, third seed Marin Cilic, fourth seed Alexander Zverev and sixth seed Grigor Dimitrov have all fallen. But it's business was usual for Federer as the defending champion took his consecutive sets won at Wimbledon to 29 in a third round dismissal of Germany's Jan-Lennard Struff. Federer's 175th win from 200 career grass-court matches saw him overtake Jimmy Connors as the most successful male player on the surface. Although Federer is approaching peak form, he knows world number one Rafael Nadal -- yet to drop a set in his first three matches -- and three-time Wimbledon winner Novak Djokovic -- playing his way back to his best this week -- are lurking as potential final opponents. "Novak and Rafa, all these guys are still in the draw," Federer said. "At the end of the day I feel on our side not that much has happened. I know on the women's side more so. "In the past it has made me nervous when I've seen bigger guys go out. "I feel like, 'OK, it's me next time'. I didn't feel the effect this time." Djokovic goes into his match fuming at what he claimed was unfair treatment meted out to him from the Centre Court crowd on Saturday as he dumped out Kyle Edmund, Britain's last singles hope. "A couple of guys pretending they were coughing and whistling while I was bouncing the ball more or less to the end of the match," said the former world number one. "I just think it's not necessary. That's what I didn't like." All 16 fourth round matches across the men's and women's events will be played on Monday. With the draw opening up in her favour, Williams is widely expected to make history with a first Grand Slam title since the birth of her daughter Olympia in September last year. A series of unexpected results have seen Garbine Muguruza, Maria Sharapova, Simona Halep, Petra Kvitova, Venus Williams and Caroline Wozniacki all eliminated. The 36-year-old faces Russian qualifier -- and fellow mother -- Evgeniya Rodina in the last 16. Williams will equal Margaret Court's record of 24 Grand Slam titles if she wins Wimbledon for the third time in the last four years. Having missed Wimbledon last year due to her pregnancy, Serena is on a 17-match winning streak at the All England Club. It is a remarkable record sure to alarm her opponents, but Williams, seeded 25th after her maternity leave, admits that fear factor can be a double-edged sword. "Yeah, there's definitely that aura, that kind of thing of playing Serena," she said. "Every single match I play, whether I'm coming back from a baby or surgery, it doesn't matter, these young ladies, they bring a game that I've never seen before. "That's what makes me great: I always play everyone at their greatest, so I have to be greater." Karolina Pliskova, the seventh seed, is the only top 10 ranked player remaining, but she has never won a major title. The Czech faces Dutch 20th seed Kiki Bertens, who stunned five-time Wimbledon winner Venus in the third round.